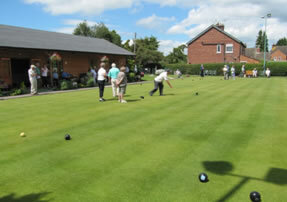 Willaston Bowling Club is a friendly, sociable and welcoming club and also proud of its competitive bowling teams that represent the club in various leagues. We have friendly bowling on Monday, Wednesday and Friday mornings starting at 11am.Throughout the closed outdoor season we hold friendly short mat bowling on the same mornings starting at 10.30am. as well as competitive league teams playing some evenings. In the Clubhouse we also hold evening Quiz nights, Rummikub sessions, Whist drives etc. through the outdoor closed season. If you would like to have a try at bowling and or wish to join the club for details contact Bernard Moores on 01270669794 or Mike Forbes on 01270662523. All are welcome. Our location is, WBC, Off Coppice Road, Willaston, Nantwich, Cheshire.